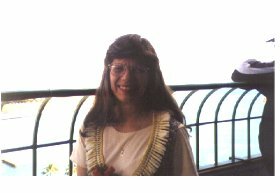 Ellen Miyasato from HERN reached out and placed a gorgeous lei around my neck when I landed on Oahu on July 4th around 1:30 PM. 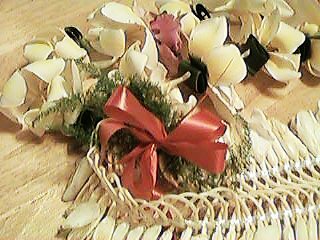 This was only the first of many beautiful leis that would surround me with their sweet fragrances. The "Thunderbirds" flew overhead in a spectacular Fourth of July HQ Pacific USAF 50th Celebration Airshow over Waikiki Beach just minutes after I landed. 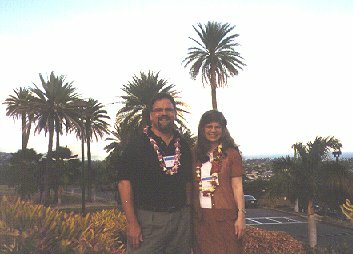 Ellen took me to the Aloha Tower where we could see a breathtaking panoramic view of Honolulu. From the first minutes of my arrival I could not stop looking at the gorgeous mountains. The Eastern Shore of Maryland where I live is as flat as a pancake. 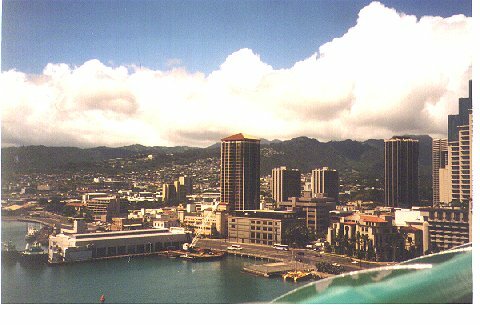 The Koolau Mountains can be seen in the background of this picture I took from the Tower which also shows downtown Honolulu. Here I am (after flying 10 hours) on the observation deck. Look closer at the beautiful leis Ellen and Lynne Sueoka gave me. 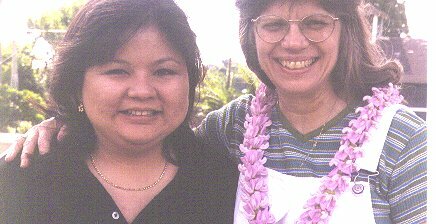 A little after 5 PM Ellen put me on an inter-island flight to Kauai where KIDLINK friend, Lynne Sueoka, met me at the Lihue airport. The island of Kauai is only 33 miles across and my friends in Salisbury worried that it was not big enough to land a plane on! I'll admit that the pilot put on the brakes *real* hard when we landed. Lynne and her daughter, Dawn, son, Darren, and several of their "ThinkQuest" team members took me to dinner at Hanamaulu Cafe where we walked in the Japanese gardens. Lynne, Dawn and I are pictured in the garden. Cory, Darren and Jeff took some time away from their ThinkQuest project to have dinner with the Maryland visitor. By this time my body thought it was midnight. I told Lynne that I thought I had already eaten three meals this day since I was fed on every airplane! We ate a delicious dinner then the kids and Lynne went back to school to work on their ThinkQuest projects while Mama Weeg went back to Lynne's home to sleep.... ZZZZZzzz..... I was *really* on the islands of Hawaii! Incredible. In the morning Lynne and I headed out to Hanalei Valley and met with teacher Melanie Hermstad from Hanalei Elementary School and writer, Chris Cook. Melanie and Chris showed us their Web page about the shipwreck - Cleopatra's Barge which is "the first deepwater yacht built in the United States and the royal yacht of Kamehameha II." It is within walking distance of their school. 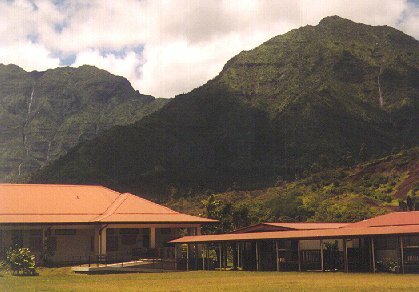 Lynne and I returned to Kaumauli'i School to see the ThinkQuest kids and to give me a chance to meet with the Kauai Inquiry group, Keith and Leah. 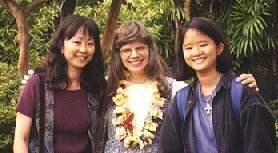 I met Rachel, another member of their team, on Sunday on Oahu. Later that evening Lynne's husband, Jed, took us to see a memorial to the workers on the sugar plantations in Koloa, a town where his uncle owns a shop. 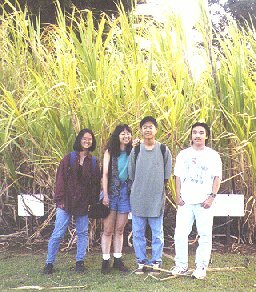 Lynne and the kids posed in front of sugar cane plants for me. 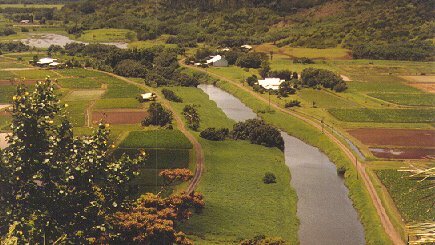 Doug Albrecht, who takes tourists on plantation carriage rides writes, "The sugar waste industry provides Kauai with 40 percent of its power," and, "Did you know that in a four-inch cane stalk there's less sugar than you'd find in a single M&M?" I had no idea that it takes a ton of water to produce a pound of sugar. 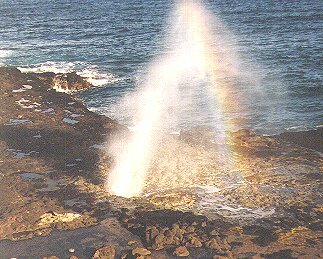 We got back into the car and drove to the famous "Spouting Horn" a natural phenomenon formed by waves which force water through a hole in the lava formation. As the water sprayed up in geyser-like fashion, we could hear a strange groan. Local legend claims it is the sound from a lizard trapped within the lava tube. The evening ended after a fantastic dinner at Brennecke's steak and seafood Restaurant. 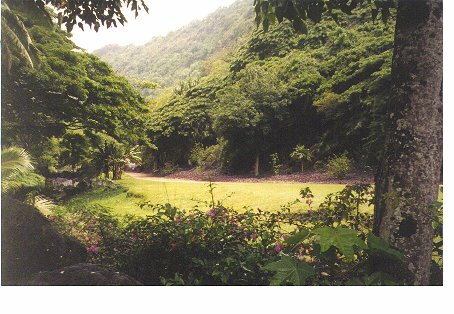 Kauai is truly "The Garden Isle" and I found a Web page where the Wilcox students tell of some of their favorite things to do on Kauai. 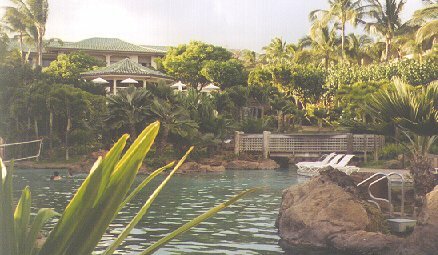 Lynne, Dawn, Darren and I flew to Oahu and settled in at the Sueko hacienda on Oahu with Karen and son, Trevor. 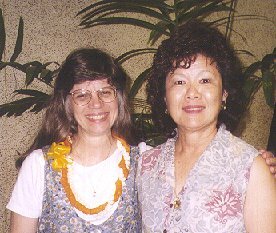 We visited Lynne's parents in their home and I met another teacher from the Kaumuali'i Inquiry Team, Rachel Furutani. HERN! 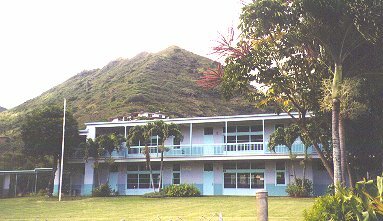 The Hawaii Education and Research Network Summer Institute began at Kapiolani Community College at Diamond Head. We arrived bright and early and as it was my turn to deliver my presentation I was drawn to the windows stretching across the whole cafeteria wall. 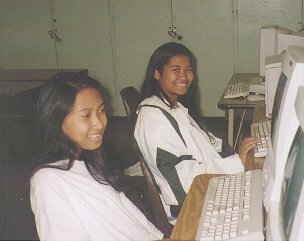 I told the group of teachers that I had learned Windows 3.1 and WIN 95 but they had the best "windows" of all. The view of the mountains would distract me all week! Here's proof that I really *did* work while I was here. During the keynote I used these WWW pages. 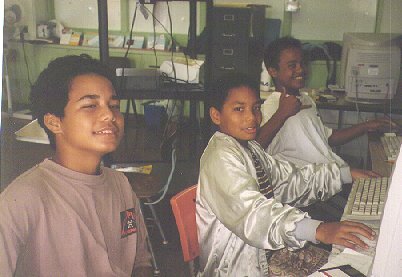 My "Global Classroom" web pages show many examples of how teachers can use the Internet in the classroom. Many thanks to Riki Kurihara and Michael Sasaki who helped on the tech end and made my presentations worry free. Riki, how did you escape my camera??? Shame on me. 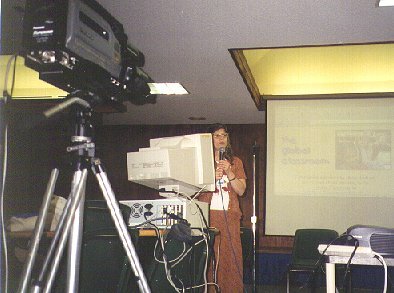 DJ Perry was the other keynote speaker from Santa Barbara, California. His theme was "Thinking Globally...Acting Locally". DJ shared the story of "...building a community-based web project focusing on history, landmarks, events, interesting people and places, culture and government." DJ and Ellen smiled for my camera. 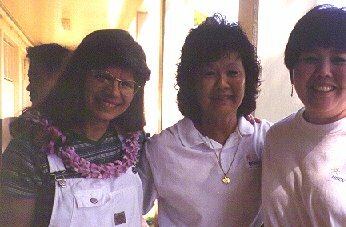 Michael Sasaki and I flew to the Big Island (Hawaii) early Tuesday morning and met with Hazel Nakano at Waiakea Elementary School in Hilo. I talked with small groups of teachers and enjoyed hearing about their inquiry projects. 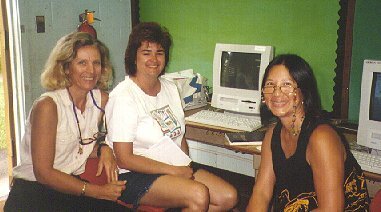 The Keaau team is focusing on "Voyaging...past and present". Karen Chang, Bobbilyn Akoi, both from Waiakea Intermediate School, are looking at environmental impact issues...preservation of our natural habitats. They also showed me their excellent "Virtual Volcano Excursion" WWW pages made by their students. For more information on volcanoes don't miss Volcano World. 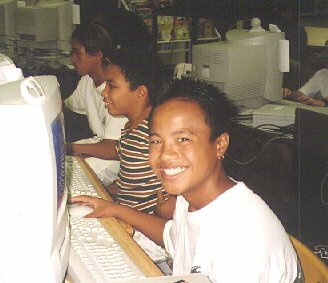 The Hawaii Community College is looking at ways to impact student learning by connecting to and becoming more aware of K-12 programs. Michael made sure the CUSeeMe connections were ready and we "met" the kids at Dole Summer School. 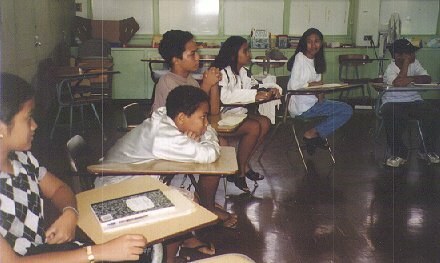 Hilo teachers and students from the Big Island joined in for the fun time. After we left Hazel and the teachers Michael and I drove to Mt. 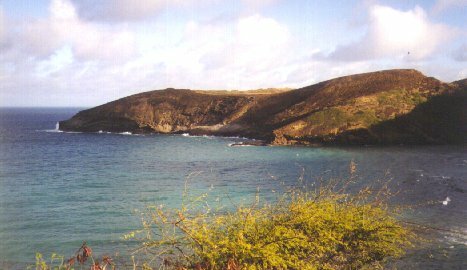 Kilauea and saw Halemaumau Crater. We wanted to take Crater Rim Drive and perhaps see the lava tubes but there just wasn't enough time. We had to be back at Hilo for our flight to Oahu. Maybe next time. Five days after I returned home to Maryland Mt. Kilauea decided to give a lava show! Back on Oahu we had a wonderful dinner with Lynne, Ellen, Michael and Connie Mark. 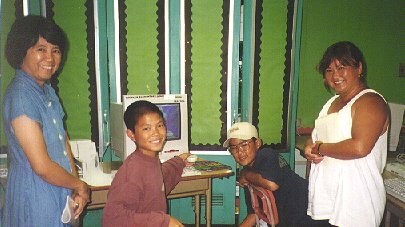 Connie and I did KIDLINK projects together waaayyyy back in 1992. It was so good to finally meet her in person. 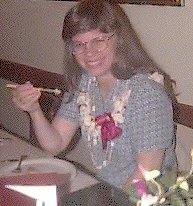 All of my friends in Hawaii ate with chopsticks at every dinner. 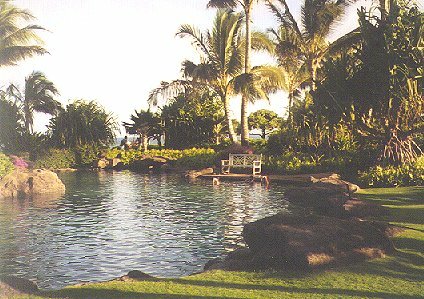 I was not having success and by this night knew I was going to die, right here in Hawaii, from starvation. (not really - they fed me quite well!) I was not mastering this skill. Still... I would not give up. I tried at each meal but notice the "security blanket" (a fork!) on the side of my plate. Eventually I would not need the fork. Lights, camera, action! 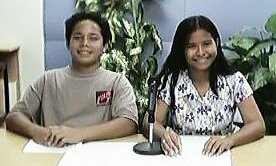 The Dole summer school kids were having the morning TV news broadcast. Parrish and Juvy were the "anchors." Who was the guest this morning? Yes... Mrs. Weeg from Maryland. My Maryland summer school students had been writing to the kids at Dole and it was a real treat for me to meet the kids in person. They are fantastic kids and were havng a super time with Mrs. Sueoka and her partner teachers. Look at these handsome faces and precious smiles. Lionel and the guys are hard at work. When not on the computer the kids sit in a circle to discuss the day's topics. Mrs. Sueoka makes a point and coaches when needed. Catch the whole group from our Maryland summer school pages. The mural in the library at Dole Intermediate catches your eyes when you first walk in. It's great! After we left school Lynne and her kids took me to look for souvenirs and eat some *real* shave ice at the famous Matsumoto's in Haleiwa town. Next stop was Waimea Falls Park which is one of the largest botanical collections in the Pacific. 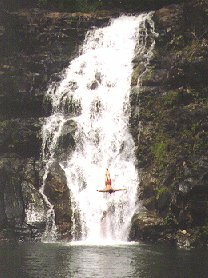 A gentle shower rained on us as we watched the professional cliff divers thrill the crowds with their daring dives. Wow! We stopped to listen to the evolution of the hula and to see the dancers. 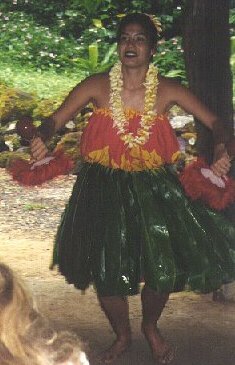 That was great though Miss Lynne's camera caught my arms swaying as they taught the small group of us how to hula! 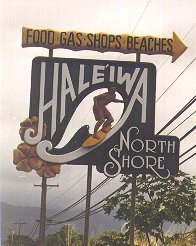 My own sons asked me to do one thing for them - visit the North Shore. Lynne, Dawn and Darren made sure I did. They stayed on the beach while I ran down to the water and put my feet in the waters of the Pacific! We don't have shoreline like this in Ocean City! More lights, camera, action! 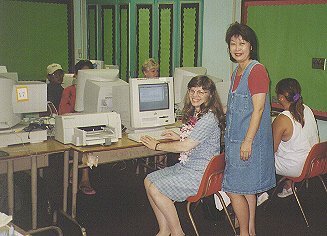 This time it was Hawaii Public TV and the "ALT.EDU" broadcast. Mahalia and Julie interviewed me and I spoke about several of our KIDLINK projects. That was fun though it was the first time I had been on live TV for so long! 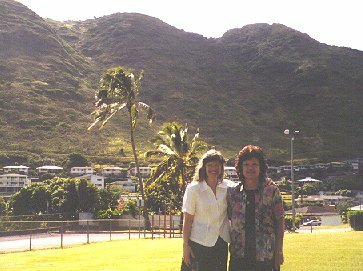 After the TV broadcast Ellen and I drove to Wailupe Valley School and met with Principal, Wendy Yoshimoto, and several of her teachers. 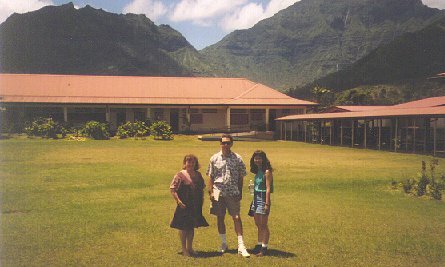 The school is located in a beautiful valley near Ellen's home. 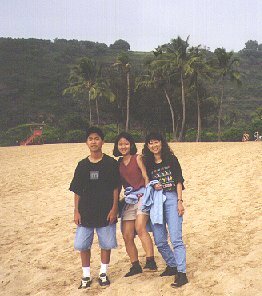 It was hard to believe that my last day in Hawaii had arrived. In the morning Ellen and I went to Pearl Harbor to see the USS Arizona Memorial. In the museum you can see a replica of the memorial. Look closely and you can see the ship below the memorial. We boarded the Navy shuttle boat that took us out to see the memorial that is built over the Arizona. 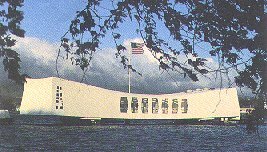 On December 7, 1941 it was hit by a 1760 pound bomb that slammed through the deck causing explosions and fires. Within nine minutes the ship sank taking with her all 1177 of her crew. Seventy-five bodies were recovered but the rest are still entombed in the sunken battleship. 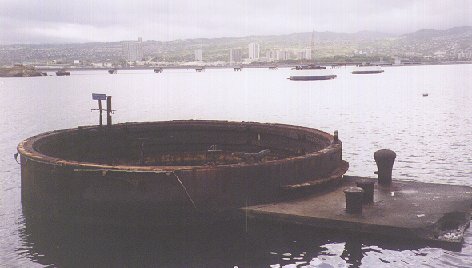 The barbette of turret three (the heary armor that supported the rotating turret) is visible in front of the memorial. 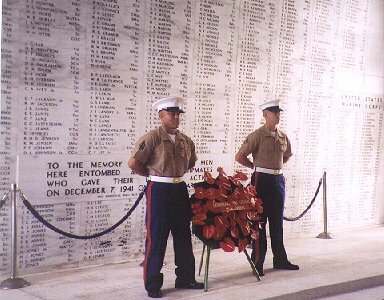 A marble wall in the Shrine Room of the memorial lists the names of the crewmen who went down with the Arizona. 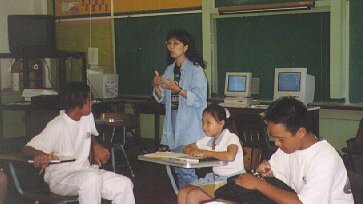 The last event on my Hawaii schedule was an afternoon of workshops at Maemae School. 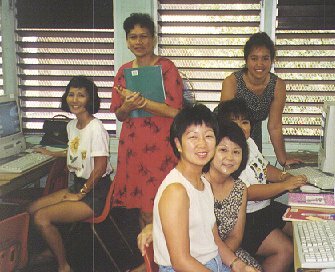 Pictured are (from left to right) Elizabeth Arnest, Ellen Miyasato, Patsy Irie, Carole Nagasako and Florine Nakasone. 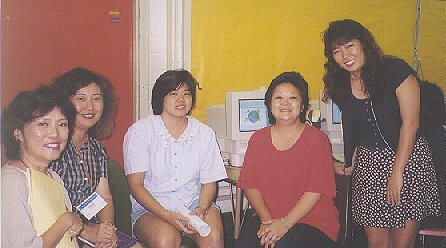 There were several groups of teachers present including Linda Kim, Elizabeth Arnest and Patsy Irie. 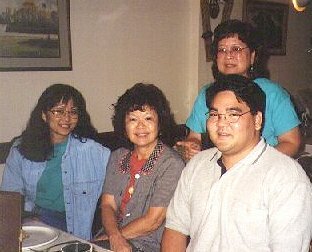 We met in the lab (pictured are: Janice Kimura, Janice Nishiki, Lisa Kumashiro, Tami Aoki and Mari Fukunaga) and then enjoyed a steakout before it was time for me to leave for the airport. Ellen and Julie and I enjoyed some conversation at the steakout. 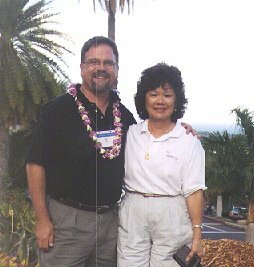 Joanne Oshiro shared several dinners with us and always brought laughter and smiles. The time had arrived. My week in Hawaii with all the fantastic HERN folks was about to end. Lynne, Dawn, Ellen and Gilbert said goodbye at the airport. I've been back in Maryland for three weeks and already we have made contacts with some of my global KIDLINK partners who are eager to collaborate with my new friends in Hawaii. We are discussing possible KIDPROJ projects about volcanoes, small islands of the world, shipwrecks and a global recipe book. 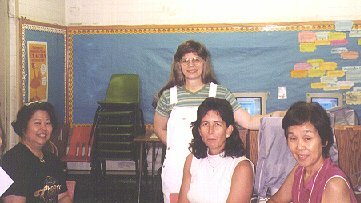 A friend of mine in Brazil has shown interest in Aiea Elementary's "The Sugar Mill" project. Ellen, you and your HERN participants have been an inspiration. Let's stay connected! Lynne, thanks so much for a wonderful week!